The conduit is the latest protective pipe for the optical fiber. It adopts the casting pipe with the vertical average distribution direction groove. The compound of silicon oxide and silicon oil lay the casting pipe inside wall. The products have the novel structure, strong and smooth inside wall, fixing the micro optical cable with lower friction force, saving time and labor, convenience for use. While using, the 5-10 micro pipes will be blown into the silicon-core pipe Ø33/40mm by the special air blower, thus the pipe capacity is expanded by maximum and the city ground is avoided second digging. 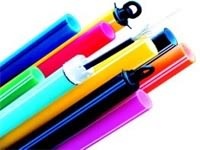 Specification: Ø5mm, Ø7mm, Ø10mm. 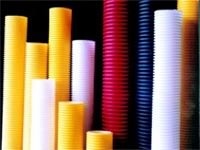 HDPE double wall corrugated pipe is made of HDPE and once extrusion molding made by the internal and external extruders. The inside wall is smooth, outside wall presents the trapezium corrugated pattern. Between the outside and inside wall is the hollow sandwich. This product has many excellent properties, for example: high intensity, light weight, sound insulation, shock absorption, better ultraviolet ray resistence, long duration of service, excellent bending property, pressure resistence and high shock absorption etc. It can be laid in the bad geographic condition region. The seal property is excellent. Those make the construction convenient. Specification: Nominal (internal/external diameter): Ø90/104mm, Ø93/110mm, Ø95/ 110mm, Ø100/110mm, Ø125/135mm etc. Production Equipment: corrugated pipe product line made in Germany, product line assembled by the imported fittings at domestic.